PUNE: Swiss watch brand Longines had the pleasure to present its Record collection in presence of actress Bhumi Pednekar at Longines Point of Sale (POS) in CT Pundole and Sons, MG Road. In the purest watchmaking tradition of Longines, this collection combines classic elegance and excellence, aspiring to become the spearhead of the brand. The very well known film actress Bhumi Pednekar launches the Longines POS at CT Pundole and Sons located in one of the most popular locations in Pune, MG Road. This POS features the latest Longines collections, including the most iconic timepieces of the brand as well as its new models. 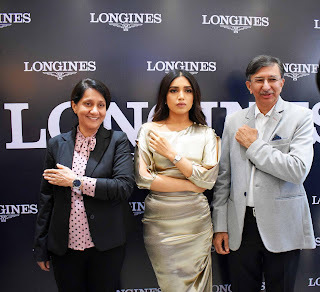 Speaking on this occasion, Bhumi said: “I am extremely happy to be a brand friend of Longines, a brand known for its world class watch making expertise. I think this Record collection will do exceptionally well especially during Valentines as it reinstates the ethos that defines any strong relationship - classic and timeless. The Record collection is designed for both women and men. All of the models feature the 3 working hands/date version, with a steel case – and a diamond-set steel case on two dials, for women – or a rose gold case. These watches are available with a stainless steel bracelet (for the steel models) or an alligator strap.